Officials of the Embassy of the Republic of Sierra Leone in China has provided a total sum of ten thousand Chinese Yuan (¥10,000), approximately twelve million, seven hundred and thirty-five thousand, five hundred and thirty-four Sierra Leones (Le12,735,534), as support to the Sierra Leone Students’ Union in China (SLSUC)’s annual convention. The annual convention, which started on 4th February, 2019, would be concluded on 8th February, 2019, with a general cleaning of the entire embassy premises by the new students’ union executive. 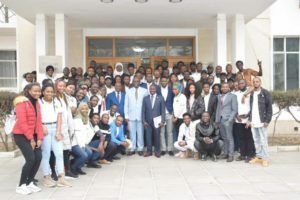 The above amount of money, according to Sierra Leone’s Ambassador Ernest Mbaimba Ndomahina, excluded the accommodation, among other things, that the embassy provided for the over 200 students that participated in this year’s event. While delivering his keynote speech on 4th February, 2019, on the theme: “Education: strength in nation building”, Ambassador Ndomahina said a nation’s enduring future hinges on education, noting that it is the cornerstone of national rejuvenation and social progress. “It is a fundamental way of promoting citizens’ standard of living and promotes their all-round development. Giving priority to developing education and raising its modernization level are key to attaining the goal of building a moderately prosperous society in all aspects,” he told his audience. He cited President Bio’s speech in which he emphasised that his government has gone down the path of free quality education because in modern times, educating the citizens of a country will not only serve as a catalyst for growth and development, but a firm foundation that supports every fabric of society. 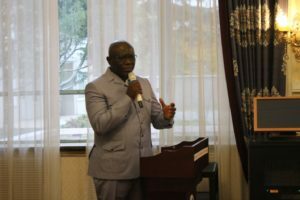 “Also, there was a problem with regards the arrears of payment of Sierra Leone supplementary allowance to the students on grants-in-aid (SLGs) awarded by the Ministry of Education, Science and Technology (MEST).Names of many of students who were supposed to benefit were omitted from the list,” he told the students. Ambassador Ndomahina said he learnt that a good number of the students’ body were private, who reverted to doing trading or working with the aim of paying fees. But according to him, he later realised that unlike the United States and United Kingdom, students on Visa X were not permissible to work in China. “I called two representatives of each of these affected categories to a meeting, where we agreed that the government should prioritise the outstanding payment of the backlog of supplementary allowances, and also consider the inclusion of all omitted names of SLGs beneficiaries,” he said. As a leader, he said, he travelled to Sierra Leone and held several meetings with concerned ministries, but that the most important meeting was the one with President Bio, who urged to address the students’ issues in China. “We are considering of appealing to government for the inclusion of the other categories of students because it will help to promote unity among them as well as alleviating their financial constraints. Let me conclude by saying that education towards leadership is not about titles, positions or flow charts but it’s about one life influencing another,” he said.